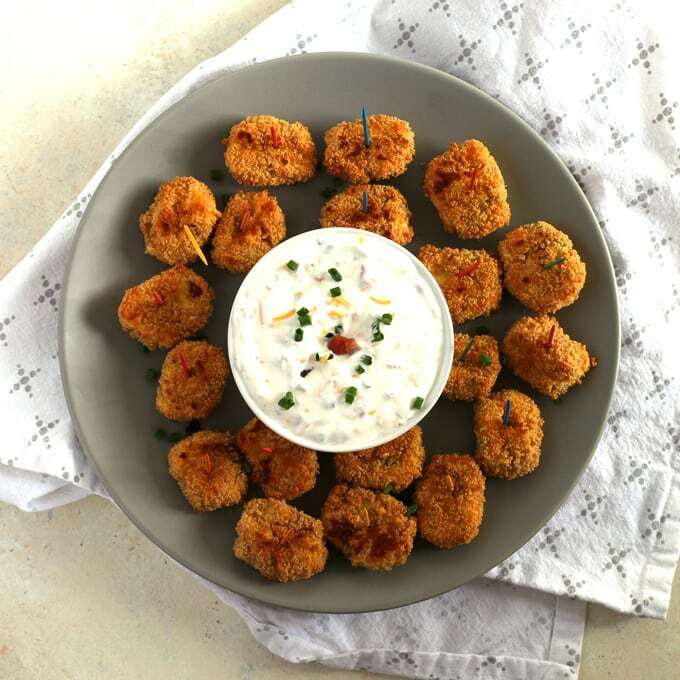 Dip these baked loaded mashed potato tater tots into my creamy loaded potato dipping sauce. They are the perfect healthier way to use leftover mashed potatoes! I am totally getting ready for all the future holiday parties coming up. My favorite part of a good holiday party is the appetizers. Appetizers are one of my favorite thing to make (and eat.) They are delicious little bites of tastiness that I can never turn down. More than one dinner in my life has consisted of solely apps. And I’m not ashamed, not even a little bit. I’ve been experimenting with lots of different recipes and this recipe for baked loaded mashed potato tater tots is going to be a party pleaser. This really is the perfect recipe for the holidays. I used instant Supreme Baked Mashed Potatoes to make these tater tots and added a dash of loaded mashed potato ingredients to bring out the flavors even more. In all honesty, it wasn’t necessary because the mashed potatoes have so much flavor on their own. But, these are named loaded, so I loaded them up. This recipe would be PERFECT for the day after Thanksgiving or Christmas. You can make a big batch of mashed potatoes for your holiday dinner and then use the leftovers to make these tater tots. Plus, they’re baked. Which means they’re healthier than any fried tater tots you may be craving. 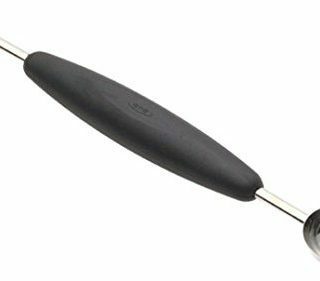 Don’t worry, once you have one of these you’ll be craving baked loaded mashed potato tater tots all of the time. I couldn’t make an easy appetizer recipe without making a dip to go with it. Originally I was going to add sour cream to the tater tot recipe but I made a last-minute decision to exclude it. But, you can’t have a loaded baked potato recipe without sour cream. Enter the Loaded Baked Potato dip. It’s creamy and has all of the flavors of your favorite loaded baked potato. Just add baked loaded mashed potato tater tots. In a medium bowl, combine the mashed potatoes, egg, flour, cheddar cheese, bacon and chives with a wooden spoon. 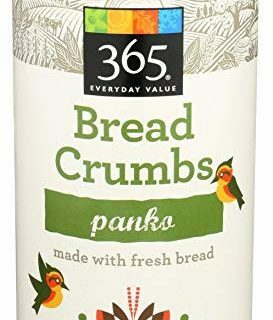 Pour panko bread crumbs onto a medium sized plate. 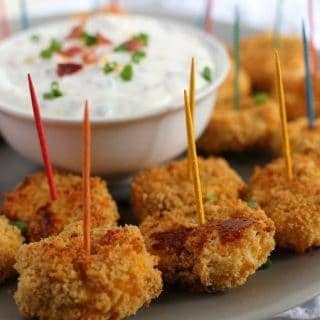 Use a melon baller to scoop out the mashed potato mixture and place the mashed potato ball into the panko bread crumbs. Roll the mashed potato until covered, then use your fingers to form it into a tater tot shape. 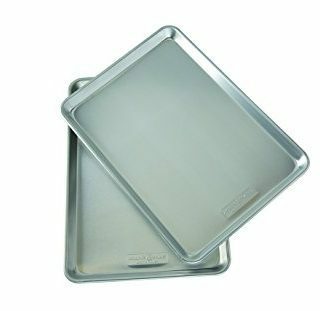 Place on pan. Repeat until all the mashed potatoes are covered in panko, refilling the panko plate as needed. 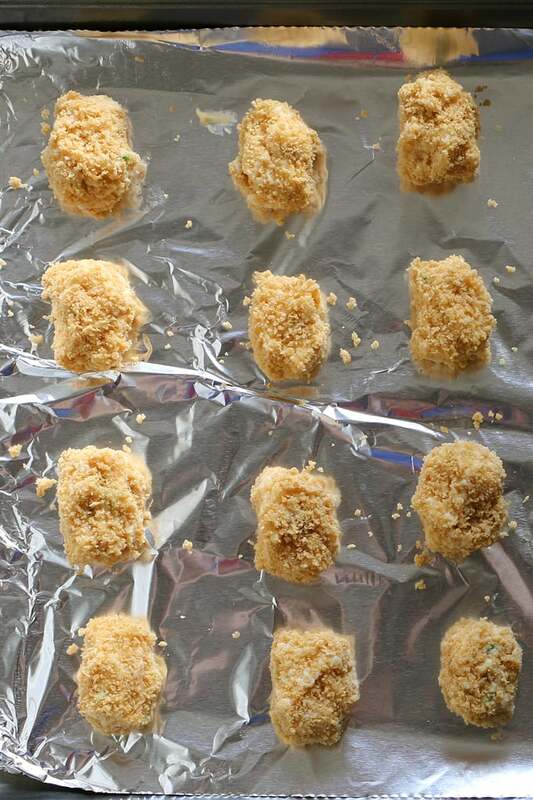 Place in the oven and bake for 25 minutes, turning the tater tots once halfway through baking. Remove from oven and serve hot. To make the dipping sauce, combine all ingredients in a small bowl. Chill for 20 minutes before serving. These look awesome! I also love that they are baked, and not fried! Thanks for the wonderfully fun recipe! Dinners made up of only appetizers are my favorite kind. These would disappear in no time at our house! These little tots sound amazing. I could probably clear that whole plate! I bet these literally MELT in your mouth! So delicious! This is a great recipe to have this time of year. With the holiday parties starting up and the game day get together. These will for sure please a crowd. What a fun recipe!!! Definitely a dish that will fly off the plate! Thanks for sharing this! Delicious! Perfect for holidays, gameday or any other day that ends in Y! What a great recipe for a party. I can’t wait to try these. 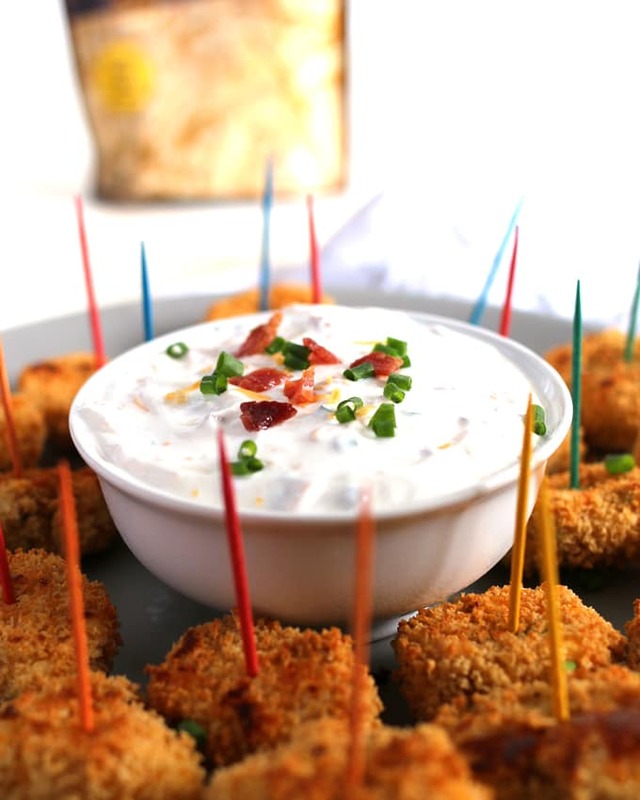 I’m all about appetizers, and I’m all about potatoes! Such a great idea here, for big kids and little ones; (Moms and Dads included!) Our guys are going to love these, congrats on such awesome creation here!!! This idea is perfect with upcoming holiday party season! I’m going to make these! 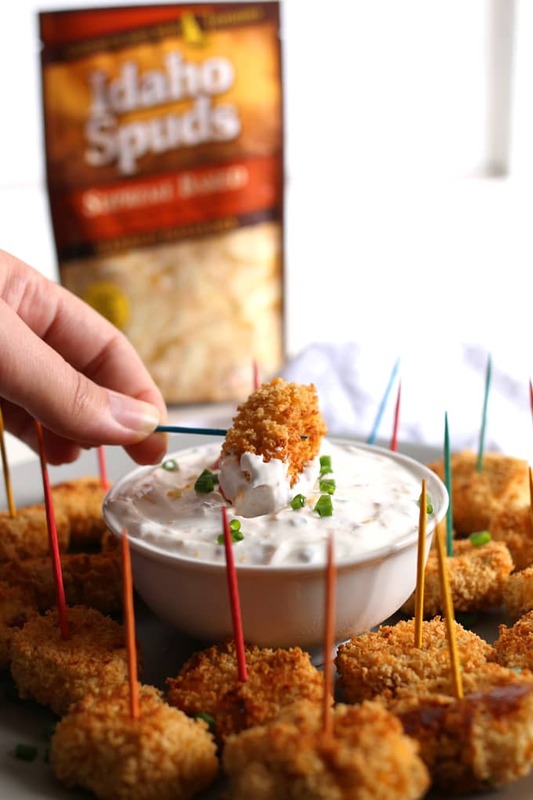 These may be my new favorite appetizer! Great idea! This is such a great way to use leftover mashed potatoes! I know these tator tots would be very popular at my house! I didn’t even know such a product existed! These little morsels look delicious! These are SO fun and pretty darn genius! For our huge Thanksgiving reunions, we always have mashed potatoes left over. I am always in charge of tailgating snacks while we pile around the TV Friday afternoon. What a great recipe for feeding the hungry group and getting rid of those leftovers! 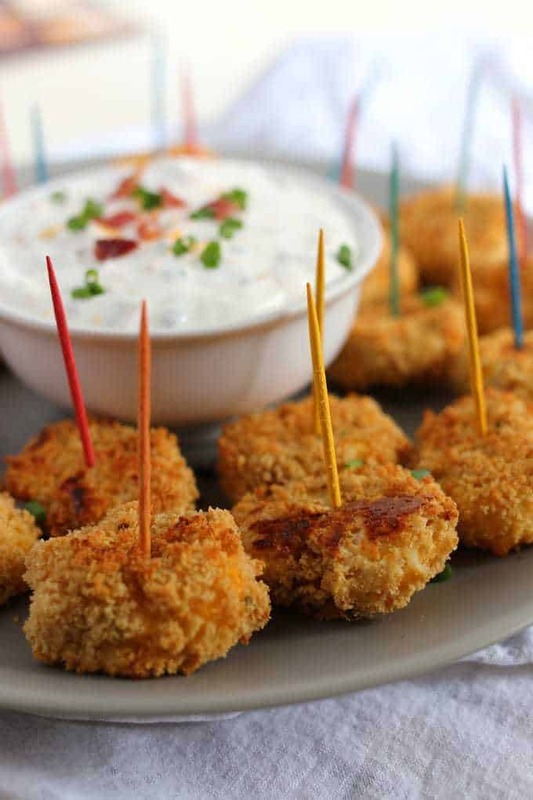 These little appetizer tater tots look so good. I love the crunchy texture and those bacon pieces you added! my family will love these! I’ll add this recipe to my Holiday Appetizer Buffet menu. Thanks for sharing it with us! What a tasty idea for an appetizer. Thanks for sharing with us at Throwback Thursday. Pinned and Shared! Saving and pinning this for later! This is the perfect thanksgiving left-over dish and I cannot wait to make it before and after it! Thanks so much for sharing this on #shinebloghop! What a great idea! I have never seen anything quite like this! Thanks for sharing on the what’s for dinner link up!